Christina Garbalosa, age twenty-four, assumes the position as Assistant Drum Major for the Hurricanes in 2017. She attended Cheshire High School where she played clarinet, saxaphone, and baritone in the marching band. From there she went on to the University of Delaware Marching Band where she played tuba. Christina has been a member of the Hurricanes for the past two years playing tuba and joined the Hurricanes to continue her love of music. She has a two year degree from Quinipiac University in Spanish Education. She hopes that the fans this season will enjoy watching the Hurricanes show as it is extremely fan friendly. In her spare time Christina loves to knit, crochet and read books. And to all the single male fans and corps members out there, you can relax as this very attractive young lady has a boyfriend! 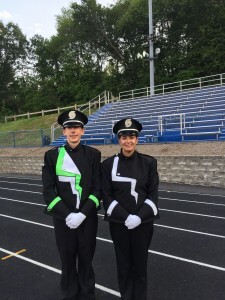 The drum corps community wishes Matt and Christina the best of luck this season as both of these young people have the right mind set, attitude, and personalities to make them succeed.